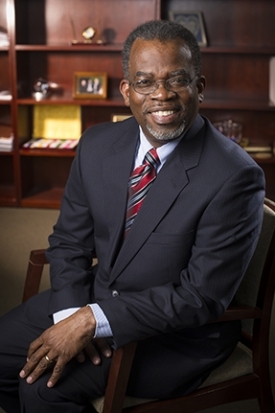 Dr. Eric P. Jack is the Wells Fargo Endowed Chair in Business Administration, Professor of Management, and Dean of UAB's Collat School of Business. He received his bachelor's degree in industrial engineering from Georgia Institute of Technology. He earned an M.B.A. with an emphasis on research and development management from Wright State University and a doctorate in operations management from the University of Cincinnati. Before being named Dean, Dr. Jack served as interim dean of the UAB Collat School of Business from September, 2012 until April, 2013. Prior to this, Jack also served as associate dean for four years and for one year as interim chair of the Department of Management, Informational Systems and Quantitative Methods. A passionate teacher, Jack was awarded the 2006 UAB President's Award for Excellence in Teaching. As Professor of Management, Jack's research interests include operations strategy, flexibility, health care management, service operations, quality management, and supply chain management. Before beginning his academic career, Jack served for 21 years as a US Air Force officer where his responsibilities at various international locations involved facility planning, design, construction, and maintenance. He was a member of the Leadership Birmingham Class of 2014, and served on the boards of Malcovery Security, The Innovation Depot, Rotary Club of Birmingham, and United Way of Central Alabama. A naturalized US citizen, Jack was born on the island of Trinidad and Tobago. He married his engineer classmate, Ave Parker Jack from Augusta, Georgia who is also an instructor at UAB.